Dubai: A ghaf-planting programme has been launched to encourage residents to plant indigenous trees and learn more about the desert environment and how its ecosystem thrives. Goumbook.com, a regional environmental website and directory of environmentally-conscious businesses and initiatives launched "Give a Ghaf" Tree Planting Programme in partnership with Ecoventure, a field study centre for students in the Northern Emirates. The ghaf (Prosopis cineraria) was chosen to coincide with the UAE's national Environment Day last week. When the trees will be big enough, Goumbook and Ecoventure, in association with the UAE Environment and Protected Areas Authority, will donate them to parks, schools or urban areas where natural shade and greenery are needed. In the UAE, it can be seen growing on low sand dunes. 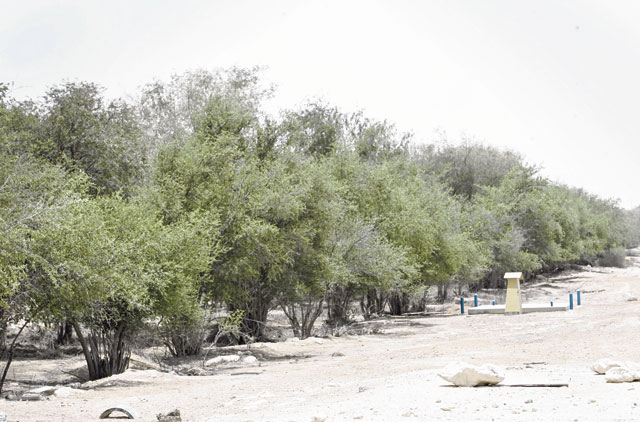 According to the Emirates Wildlife Society-WWF, mounting developmental and demographic pressures are contributing to the tree's decline as ghaf woodlands are being cleared and groundwater over-extracted; depriving the trees of the little water they need to survive. "The ghaf is a multipurpose tree of arid lands that is even considered a solution to desertification, Tatiana Antonelli Abella, co-founder of Goumbook, said. "The trees will be planted as seeds provided by the Environment and Protected Areas Authority and when the trees reach a good height we would like to organise trips to see the Goumbook nursey before we donate them back," she added. The ghaf is a drought-tolerant, evergreen tree that is possibly the sturdiest plant of the harsh desert environment and is suffering due to over grazing and habitat encroachment. The existence of ghaf in an area indicates the presence of groundwater. The ghaf grows in the desert regions of south-eastern Arabia, as well as in Iran, Afghanistan, India and Pakistan.